SHS Employee of the Year 2015-2016: Meet Doug Hill! Doug Hill with his very proud daughter, 4th grade teacher Stephanie Handrahan. 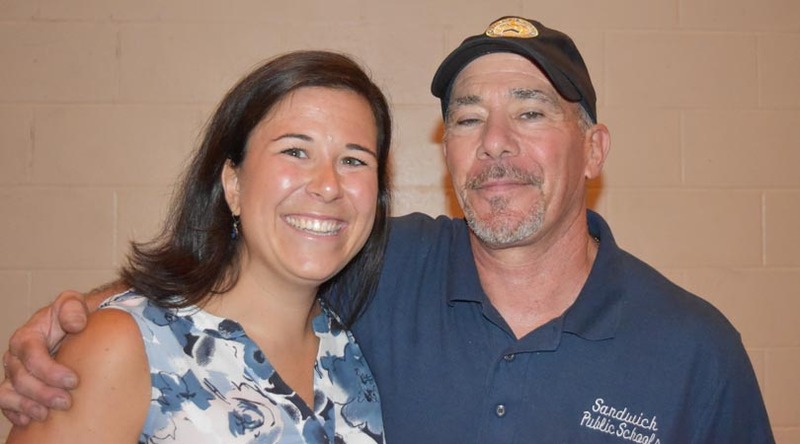 At the August 31, 2016 Opening Convocation for the Sandwich Public Schools, SHS Principal Dr. Ellin Booras shared the following remarks in honor of longtime custodian Doug Hill. Doug Hill began his career in Sandwich in 1990. During his 26 year career, he has been an exemplary employee in every way. Doug Hill is the consummate professional whose work ethic is legendary throughout the district. Doug is the ultimate McIver who can fix anything. Arriving well before the sun rises, Doug knows every corner of the building, methodically working his way around every nook every morning. His is proactive and always out ahead of an issue, applying impressive logic and analytical approach to each situation. When we hear Brenda Kinchla’s voice on the radio at the start of a school day, politely requesting, “Doug Hill, please call the office,” all who hear her know that Doug will appear with a solution to any request. In addition to his technical skills, knowledge, and expertise, Doug is an outstanding communicator. He works beautifully with teachers, administrators, coaches, parents, and students. The sight of his tool cart in the hallway is reassuring to all that Doug has everything under control. I have had the privilege of working with Doug for 19 of his 26 years. No matter what dilemma defines our day, what issue captures our focus, he provides reassurance, good old common sense advice, and a sincere offer to check on the building on weekends and after hours. He has answered countless alarms, has earned he widespread respect of the Sandwich Police and Fire Departments, and has emerged as the steady and reliable “go to” guy for all of us who occupy the castle. Whenever we are short-handed or left in a tough situation, I turn to Doug and he finds a way no matter what the challenge. Doug cares deeply about his colleagues and represents their concerns and observations with uncompromised professionalism and integrity. He cares deeply about the Sandwich School district and works tirelessly on its behalf. Doug is dedicated, hard-working, honest, trustworthy, talented, and superbly effective in all that he does. He has earned the universal respect of all members of the SHS/STEM community. He is a problem solver, a team player, and above all – a loyal and trusted colleague and friend to all who are privileged to arrive at work each morning and be greeted by his positivity, great energy, and remarkable “can-do” approach. It is my great privilege to present Sandwich High School Employee of the Year Award to Doug Hill.